PlayStation®3 is one of the most popular gaming consoles available in the market today. It can either be wired or wirelessly connected to your router. 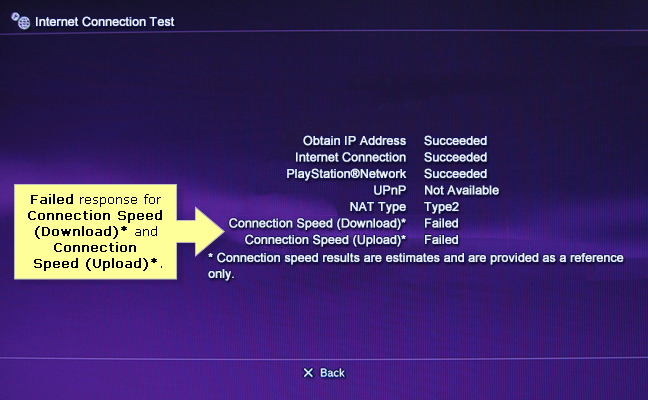 This article will help you test if your PlayStation®3 is connected to your network. On the main menu of your PlayStation®3, select Settings > Network Settings. Scroll down and make sure that the Internet Connection is set to Enabled. Scroll down to Internet Connection Test and press X. Your device will run a test to determine if the Internet connection is working. If you get a Failed response for Connection Speed (Download)* or Connection Speed (Upload)*, you may need to check if your device is connected to the network or not. For wired connection, verify the cables connecting your PlayStation®3 and your router. For more instructions on how to do this, click here. For wireless connection, ensure that the PlayStation®3 is connected to your network. For instructions on how to connect the PS3™ to a wireless network, click here. NOTE: If you get a message about IP fragments not supported, set your Maximum Transmission Unit (MTU) to Automatic.